Adidas x Fafi leather jacket (also seen here), Plaid shift dress c/o BB Dakota, ZeroUV sunglasses, Haute Hippy snake pendant, Lancaster Paris crossbody bag, Rebecca Minkoff over-the-knee boots. Shot by Isaac Lacey. 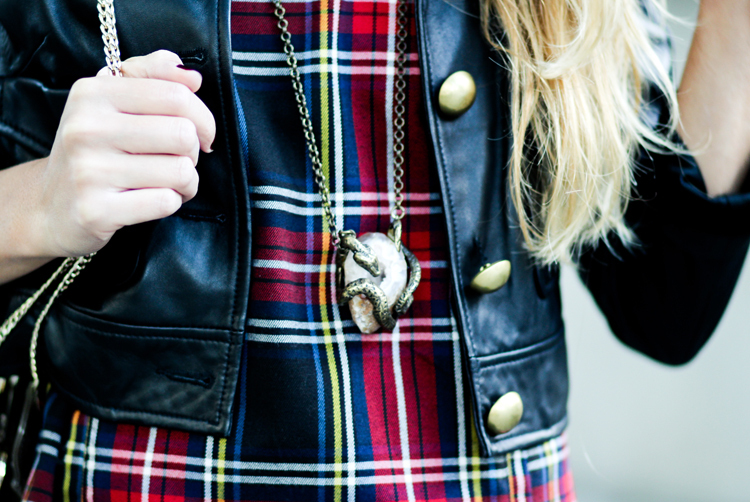 There's something about the combo of leather and plaid that makes you feel like a rockstar when you're wearing it. Even a low-key flannel or shift dress can give you the illusion that you're totally invincible when paired with say, a pair of leather skinnies or a leather jacket. Don't believe me? Test it out for yourself one day and see how you feel! A crazy pair of sunnies & some killer knee high boots are recommended, but entirely optional. cute look, love the plaid and the boots! So cool and stylish! Love the dress with the knee high boots! I adore this combo, and the boots - they are just divine!